Well another fantastic weekend of racing with the British Motorcycle Racing Club. Saturday was a scorcher, I think this is the only the second time this season I haven't put a wet tyre on the bike. After a poor qualifying session, in which I only managed to set a time of 1:48 which placed me in 16th. I managed to match my personal best time of 1:44 in race 1. Unfortunately I could not make up any places so finished where I started but the start position for race two is set by the best time from the previous race which meant I started Race 2 in 15th. In Race 2 I managed to force my way up to 9th position, this time setting a new personal best time by over 1 second from my previous. The 1:43 lap placed me in 10th for the first race on Sunday. Sunday was hotter than Saturday. I got an awful start in the first race start and fell back to approx 16th but after the race was red flagged due to an incident at Clearways I got my eye in for the second restart. At the second start I got up to 7th but I was soon caught by a couple of faster bikes and passed on the long straights that the GP circuit has. I ended this race in 9th again, with a fastest time of 1:44.6. I started the final race in 13th. I managed to hang on to the faster guys in front for most of the race only losing touch with them when I got into a battle for 9th & 10th. I ended again with the 9th spot and a lap time of 1:43.8. An additional 21 points to add to my total. 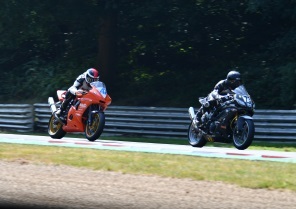 Next race weekend is Cadwell Park on the 3rd August.